Polo is a ball sport, played on horses. Where one team attempts to score goals by hitting hard hockey-sized ball through their oppositions' goal with a mallet attached to the end of a 4 1/4 foot stick. 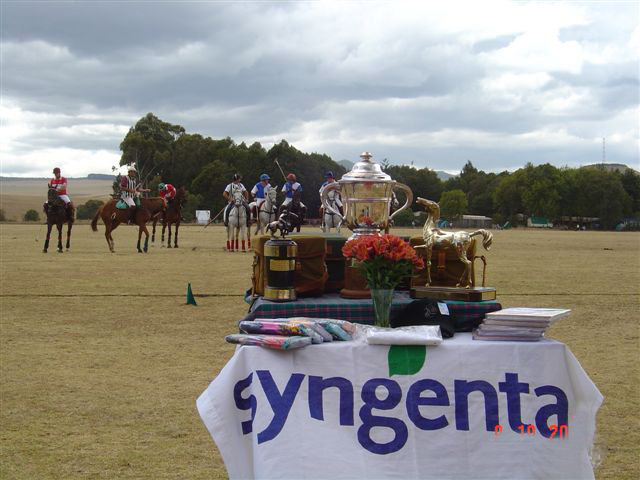 Syngenta has been one of the key sponsors of Polo Tournament in North Kenya Polo Club for a number of years. Considered to be the oldest sport in the world, Polo originated from Pakistan as a war game around 2500 years ago to teach warriors dexterity, quick thinking and aggressive aptitude on horseback. Some of our key farmers, broad acres, export vegetables and ornamentals, normally participate by either playing or cheering. This has been a great opportunity to interact with them and get to know them better. Members of staff normally attend and suport our collaboration with them. The club is still supporting the local primary school and the polo club members have committed to start a feeding program for all the children.